Beehive Cottage is a spacious Georgian cottage in the heart of Burnham Market. Owned by the same family for over 30 years, this much-loved family holiday home has a fabulous light and airy kitchen/breakfast room,comfortable lounge, 4 bedrooms and two bath/shower rooms. 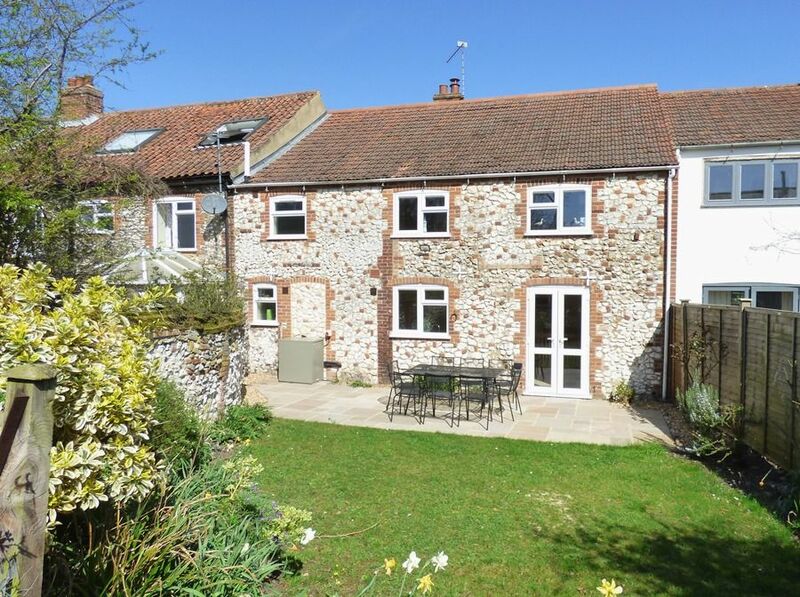 This lovely cottage is perfect for two families to share during school holidays, or for two couples wanting to explore the delights of the North Norfolk coast. It has a modern central heating system and a wood burning stove making this a warm and comfortable place to stay throughout the year. It is ideally located opposite the well-maintained playing fields with an excellent children's playground and two tennis courts. It is only a few minutes walk from Burnham Market's picturesque village green. Outside there's the advantage of a fully enclosed high walled and fenced south facing garden. The stunning North Norfolk coast with its wide open sandy beaches may easily be reached within a 10 minute drive. Please note that the owner offers a 10% discount on under occupancy for the use of maximum 2 bedrooms for a 5 night or more stay during the winter period. Entrance into the spacious hall, where there's a plenty of room for coats and boots storage. Sitting room: a lovely light and airy room with a wood-burning stove and two large comfy sofas, two bean-bags, large flat screen TV and DVD player, coffee table and a bookcase. Kitchen/Breakfast room: a fabulous huge room with a superb contemporary kitchen with integral appliances including an electric oven, a ceramic hob and dishwasher, a full height fridge/freezer and a microwave. Guests can eat in comfort in the dining area which has a large wooden dining table and eight chairs, overlooking the garden. There is a glazed door into the private enclosed garden. There is a high chair available to use if required. There is also a door from the kitchen into the back hall with a Laundry Cupboard: housing a washing machine, tumble dryer, clothes airer, iron and ironing board. There is the advantage of free fast wifi at Beehive Cottage . The staircase is straight, not steep, and has a hand rail. There is a travel cot and highchair available at the property. All the bedrooms are carpeted. High thread count bed linen and fluffy towels are provided for guests. There is a travel cot available if required (bedding for the cot is not provided) and a hair-dryer. Bedroom 1: a large room at the front overlooking the playing fields with a king-size bed, bedside tables and lamps, built-in double wardrobe, two chests of drawers and a pine blanket box. Bedroom 2: overlooks the back garden and has a double bed, bedside tables and lamps, double wardrobe with drawers and hanging space, with mirrored gliding doors. Bedroom 3: with twin beds - ideal for two children as it has the best view of the playground, but equally suitable for adults. There are two bedside tables and lamps and a wardrobe with shelving and hanging space. Bedroom 4: with sturdy wooden bunk beds, bedside table and lamp and a chest of drawers. Bathroom: newly fitted bathroom with a bath shower (fixed overhead shower), hand basin, heated towel rail, WC. There is a modern oil central heating system with thermostatic control, making this a warm and inviting place to stay throughout the year. Beehive Cottage is conveniently situated along Station Road (parallel to the village green) opposite the village playing fields with two tennis courts (available for online booking) and an excellent children's playground. Whilst there is no designated off-street parking, there are no parking restrictions and it is usually possible to park outside. At the back is a fully enclosed south-facing garden surrounded by a high wall and full height fencing, which enjoys a great degree of privacy. There is a patio with garden furniture and a charcoal kettle barbecue, a small lawn area and steps to a raised flower bed at the back. It is conveniently located only a few minutes walk from Burnham Market's picturesque village green with a wide range of independent shops, galleries and boutiques.